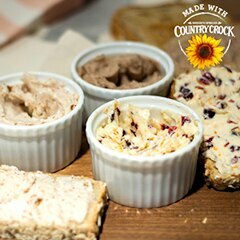 Start with 1/2 cup Country Crock® with Sunflower Oil and mix in your choice of stir-ins below for a delicious flavored buttery spread. Try them on whole grain toast, waffles, pancakes, bagels, oatmeal or muffins. Makes about ½ cup.